Author Charlie Wurz urges Americans to engage in politics, propel change in new book. I believe our younger generations are in the best position to propel the changes we need now in America, and have the most at stake as they start their life journeys. With a presidential election that could have staggering consequences for the United States right around the corner, there’s never been a more critical time for individuals to re-examine their thoughts, as well as their resulting expressions and actions. 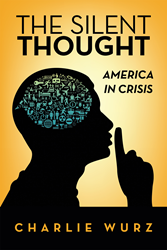 In “The Silent Thought: America in Crisis,” Charlie Wurz shares his concern for America’s path forward and the critical crises facing all Americans. Through his book, Wurz hopes to encourage all Americans -- especially millennials -- to act on the silent thoughts they have or don’t have about American politics and other crises, and to analyze other points of view with critical thought. Charlie Wurz is a government contractor and freedom-loving American. He currently lives and works in the Washington, D.C area.